Of course, one is never really sure with flycatchers, because the subspecies look very similar, so your guess is as good as mine. 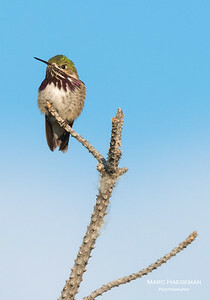 Yet this one was photographed in Wyoming, so it might well be a Willow flycatcher. Moreover, flycatchers have a great thing going for them, they defend nesting territory not by quarrelling but by singing. 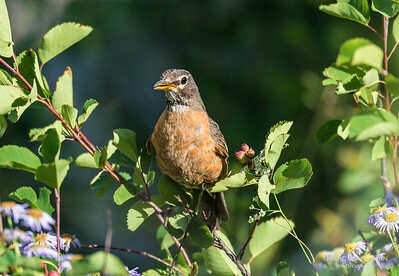 Unlike its European namesake, the American robin belongs to the trush family and only shares a similar chest color. The American robin is one of the most abundant birds on the American continent. Mostly found in thickets, the Gray catbird takes its name from the cat-like mews, yet he is also a keen imitator of other species. and makes a great variety of sounds. 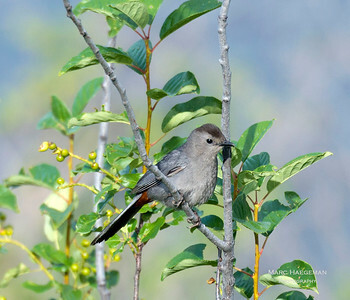 This gray catbird was spotted in Grand Teton National Park, Wyoming. 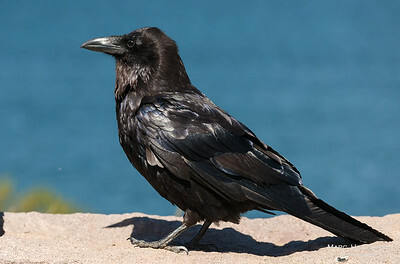 A very attractive bird, sporting a crest and bandit-like black mask but named for its wax-like wing tips. 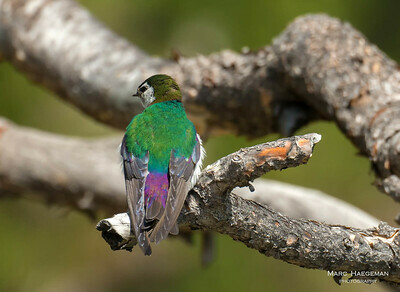 A violet-green swallow displays its magnificent green and purple feathers. 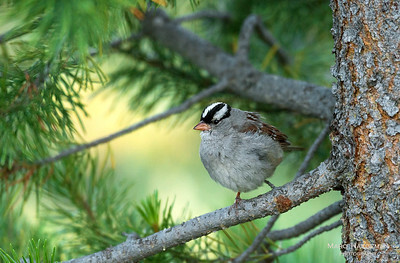 This cute guy with its distinctive black-and-white stripes on its head, is found all over North America and, interestingly, different populations have developed their own "dialects" in their singing. 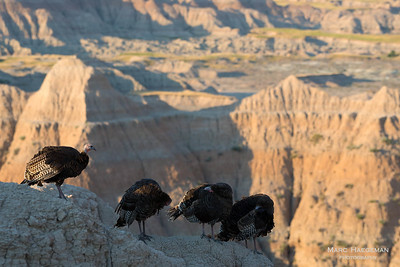 I reckon this particular one must have been singing the Wyoming dialect. This shiny black knight is a smart and highly adaptive opportunist, part omnivorous scavenger, part predator, who feels at home in the most varied of habitats, ranging from deserts to arctic tundra. 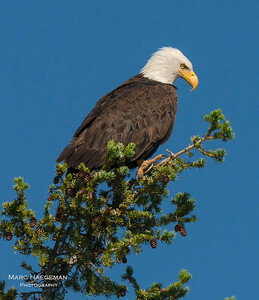 The emblem bird of the United States since 1782, it's hard to believe the majestic bald eagle was nearly wiped out in the 20th century, due to hunting and pesticides. Populations have been increasing since the 1970s, partly following the banning of DDT, yet they remain on the threatened species list. 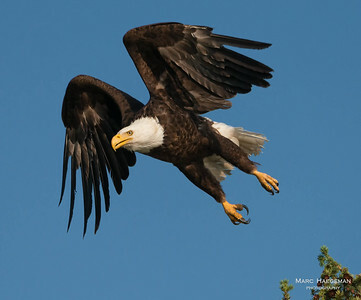 With a wingspan of up to 2.6 m, part predator, part scavenger, the bald eagle is one of America's largest birds. You sure don't want to mess with these talons! A common sight in the coniferous forests of the Rocky Mountains, named after the famous American explorer. 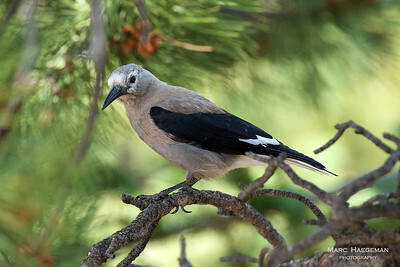 A member of the jays and crows family - and not the woodpeckers as Clark initially thought - the nutcracker caches his pine seeds and has a pretty good memory to unearth them the following spring. 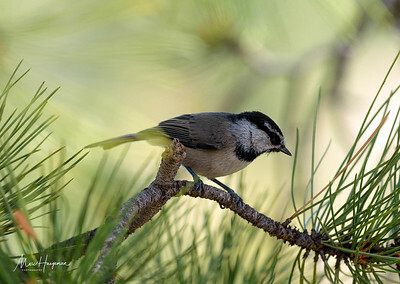 A familiar presence in the conifer forests of the mountainous West, the ever active and acrobatic mountain chickadee sports white cheeks and a unique white eyebrow stripe, which identifies it from all other chickadees. Spotted near Estes Park, Colorado. 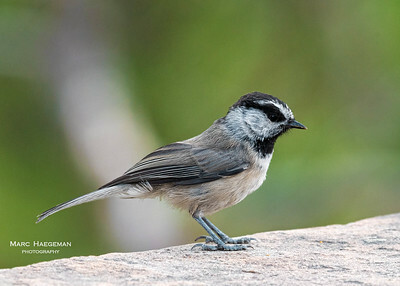 Small but notorious eaters, mountain chickadees take anything from insects, seeds to nuts. They are useful little killers of tree-destroying bark beetles and needle miners. Mountain chickadees are monogamous and form long-term pair bonds. Spotted near Estes Park, Colorado. 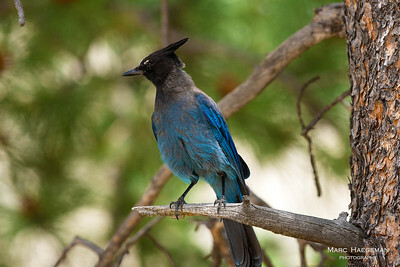 Steller’s Jays can be seen in evergreen forests of western North America. 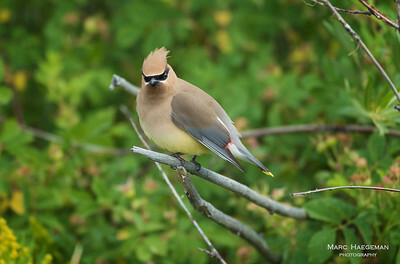 Intelligent, noisy and bold they often scavenge around picnic areas and campgrounds. Its magnificent blue plumage fully reveals itself from up close. 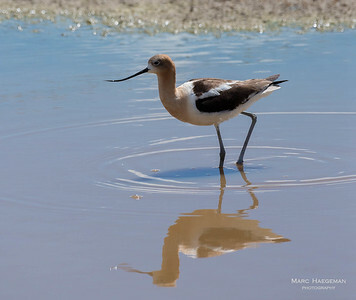 The reservoir near Walden in northern Colorado forms a haven for waders like this elegant American avocet, foraging in the shallow water. 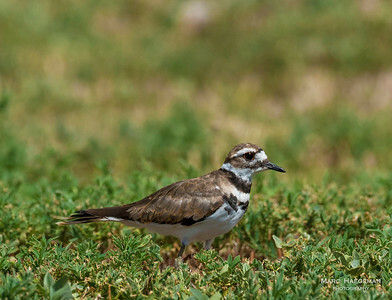 For a shorebird the killdeer can just as easily be found on open ground with low vegetation. Their interrupted runs are a sight to see, as is their fluttering show of injury, hoping to lure intruders away from their nest. Spotted in Scenic, South Dakota. 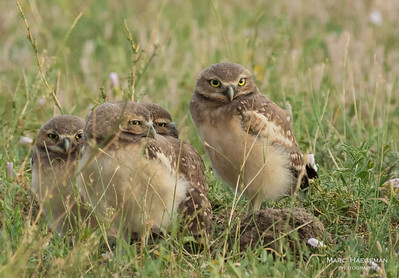 Very hard to spot in the prairie and surrounded by a network of prairie dogs continuously on the alert - not to mention the mother owl's own diversionary actions - this cute, drowsy bunch was patiently waiting for their next meal delivery. 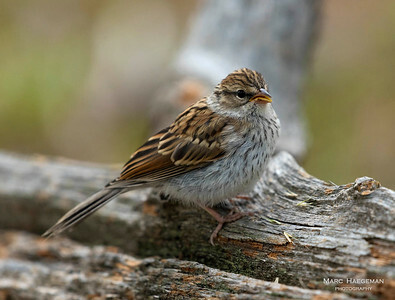 Juvenile Chipping sparrow in the South Dakota Black Hills. The Say's Phoebe (Sayornis saya) was named after the American naturalist Thomas Say, who discovered the bird in 1819 in Colorado. 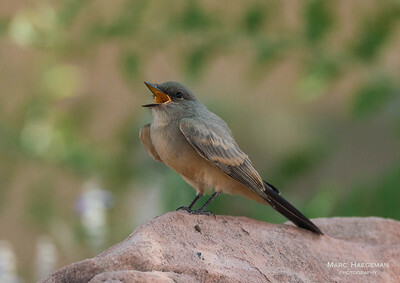 Say's Phoebe belongs to the flycatchers and is an open-country bird. 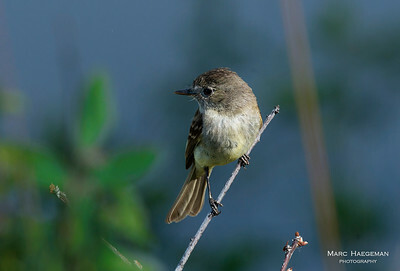 They have been living in North America much longer than humans; the oldest fossils of the Say's Phoebe date back some 400,000 years ago. Spotted in Page, Arizona. 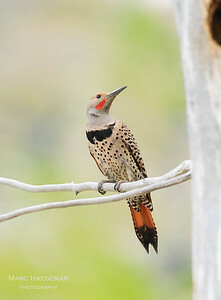 The red mustache stripe and red underside of the tail are obvious on this beautiful male red-shafted flicker. Spotted in Glacier National Park, Montana.